Terra Vista Community – The Round Rock subdivision has some of the most beautiful patches. The one on Westinghouse Road, near the east part of the back entrance, is truly incredible. Marble Falls, TX – Just 50 miles northwest of Austin sits the quiet community of Marble Falls. While you’re there, also enjoy a bite to eat at the famous Bluebonnet Cafe. Burnet, TX – Take a road trip to Burnet, the “Bluebonnet Capital of Texas,” for their annual Bluebonnet Festival. Held April 12-14, the festival features live music, parades and a wildflower show. Brushy Creek Lake Park – Enjoy an afternoon of fun out with the kids. Oh and don’t forget to snap a few pictures! Muleshoe Bend Recreation Area – This 654-acre park, nestled in Spicewood, offers 9.8 miles of trails, a scenic lake and fields and fields of spring wildflowers. Pace Bend Park – A popular recreation spot on Lake Travis boasts tons of wildflowers during the spring. Willow City Loop – Take a road trip through 13 miles of Hill Country back roads between Fredericksburg and Llano. Exploring is an adventure and the patches of wildflowers will “WOW” you! Capital of Texas Highway (Hwy 360) – Snap an authentic Austin photo of the spring bluebonnets with the 360 bridge in the background! Wildseed Farms – Nestled in Fredericksburg, Wildseed Farms’ wildflower turnout exceeds its name’s expectations. 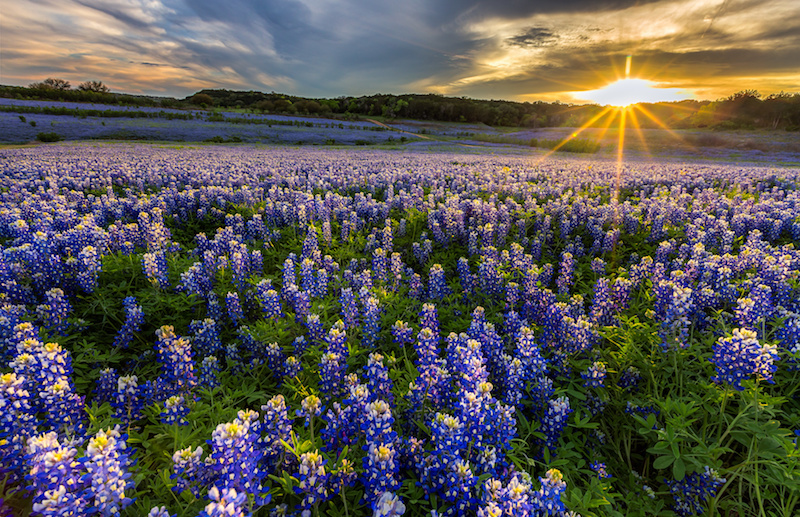 Head out for a gorgeous drive and fields upon fields of gorgeous bluebonnets. Lady Bird Johnson Wildflower Center – For more than just bluebonnets, head to the Lady Bird Johnson Wildflower Center. They have a large variety of flowers, but, as with the rest of Central Texas, the bluebonnets bloom in intense masses during the spring season. Are you searching for additional locations to snap some photos in the bluebonnets? Give me a call. I would love to help you find a location closer to home!